32-bit systems are not officially supported but a workaround exists (see 32-bit workaround). Settings will sync too, including graphics settings. Controlled by the Textures setting. Start the game in fullscreen mode and press Ctrl+⇧ Shift+← Backspace to toggle Special K's Control Panel. Restart game to apply the changes. 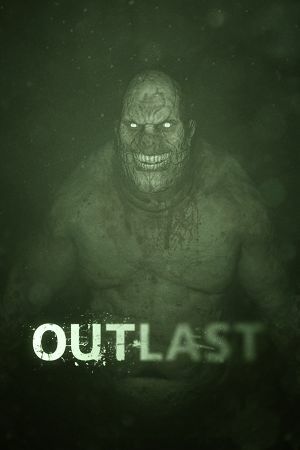 Search for Outlast in the profiles list. Set Antialiasing - Transparency supersampling to 2x, 4x or 8x Sparse Grid Supersampling (the level must match the previous setting). -0.500 (if using 2x MSAA + 2x SGSSAA). -1.000 (if using 4x MSAA + 4x SGSSAA). -1.500 (if using 8x MSAA + 8x SGSSAA). Change the second instance of bSmoothFrameRate=True to bSmoothFrameRate=False, or raise MaxSmoothedFrameRate=62.000000 value. Find DepthOfField=True and set it to false. Find ImageGrain= and set it to 0.0. Smoothing can be disabled. See Mouse smoothing. Edit Command="X" for each line/button in this paragraph to customize the controls, using the above paragraph starting with .GPBindingsB= as reference to the available commands. 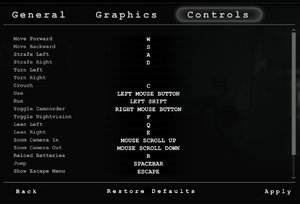 Launch the game, go to Options >> General and change Controller Configuration to Type C to use the custom layout. Changing the controller layout in this fashion will also edit the shown controller map under Options >> General >> Controller Configuration for ease of use. Also a fan made translation is available. A Turkish fan patch is available here. On some 64-bit systems the game will not launch, showing a brief black window possibly with a cryptic error 0xc000007b. This will instruct the game to run in 32-bit mode even on a 64-bit platform, which should work just the same but bypasses the issue with incompatible 64-bit system libraries. Use the -32 command line argument. Open OLEngine.ini and edit Poolsize= under [TextureStreaming]; set the value to one roughly equivalent to you graphics card VRAM. In the same file find the line TimeBetweenPurgingPendingKillObjects= and set it to 3600. If shuttering still does not go away, find and set bUseBackgroundLevelStreaming= to false. Open the Start menu, type cmd.exe, right click on it to open the context menu and click on "Run as administrator..."
In the console window, type BCDEdit /set increaseuserva 3072 and press ↵ Enter. Reboot the system and start the game. Bear in mind that this workaround can decrease the overall performance of the operating system after playing the game, so please revert the changes by opening an elevated command prompt, typing BCDEdit /deletevalue increaseuserva and rebooting the system. Change their values to 2048 and 1024, respectively. Change their values to 32 and 4096, respectively.